IEC employees repair the damage caused to the company's equipment as a result of a rocket fired by terrorists. 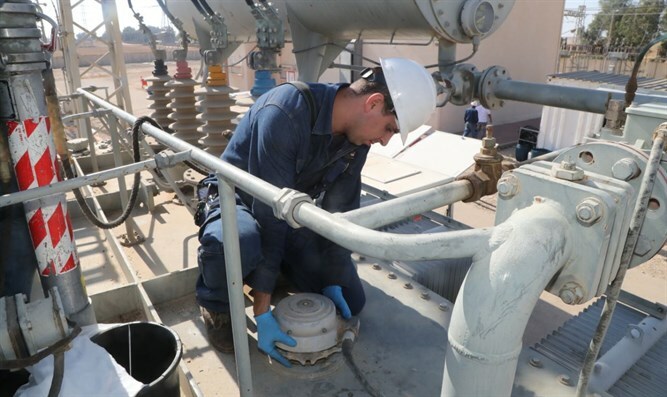 On Wednesday evening, IEC employees repaired the damage caused to the company's equipment in the Gaza vicinity as a result of a rocket fired by terrorists. Yesterday, damage from rocket strikes caused severe power disruptions to the southern Gaza Strip. At the order of Energy Minister Yuval Steinitz, the equipment will be repaired tonight only after a lull and an end to the rocket fire, in order not to endanger the workers of the Israel Electric Corporation. The Coordinator of Government Activities in the Territories, Major General Kamil Abu Rukun, explained to the Arabs of the Gaza Strip why many of them suffer from a lack of electricity. The coordinator wrote in Arabic on his Facebook page that "the massive firing during the day of the Islamic Jihad terrorist organization, under the auspices of the Hamas terrorist organization, damaged the electricity infrastructure and caused a malfunction in the electricity supply to your homes during the blessed month of Ramadan." "Residents of the Gaza Strip, it is time to wake up and understand that Hamas and Islamic Jihad are using you as hostages and continue their repeated attempts to escalate the situation at your expense, when you are the ones most hurt," added Rokon.